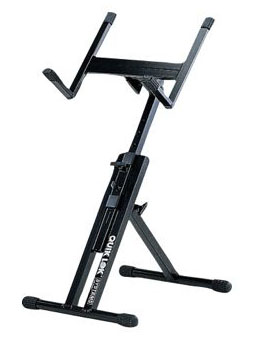 Heavy-duty, fully adjustable amp stand. Securely holds small amps and combos with up to two 12” speakers. QL/640 features 5 height adjustment positions with spring-loaded locking pin and full-circle tilt adjustable amp platform which allows for exact amp positioning. Back leg folds forward for easy portability.